Conor McGregor is back and is a looking to recapture his old UFC lightweight world title. McGregor faces lightweight champion Khabib Nurmagomedov in Las Vegas on 6th October at UFC 229, the Irishman was stripped on that title after two years inactivity following his victory against Eddie Alvarez in Nov 2016. Connor McGregor comes back after two years away from the UFC since winning the 155-pound title. McGregor did fight Floyd Mayweather in an all boxing match last year in August where he claimed he earned more than $100 million from the event, which the Irishman lost. The former two-weight world champion will now face the man who succeeded him as UFC lightweight champion, undefeated Russian Khabib Nurmagomedov. UFC President Dana White used Friday’s UFC 25th anniversary press conference to announce the fight with their promotional video to showcase the cards for rest of 2018. “The fight is done,” Dana White said. “Not difficult at all,” White told Fox Sports when asked if there was any problems at the announcement of Nurmagomedov vs McGregor. We will witness the finest lightweights on the planet battle it out to determine who is the best. He added: “You have two of these guys, who are actually both straight killers, coming out of the gate and going straight after each other head-to-head. Dana White is confident that this fight will go down as the biggest fight in UFC history other than the Floyd Mayweather fight, the clash of two titans in the lightweight division will be explosive, blink and you could miss it. “It’s a massive fight. I knew this was the fight to make,” the UFC chief said. “And I believe that this the biggest fight in the history of the company, other than the (Floyd) Mayweather fight. 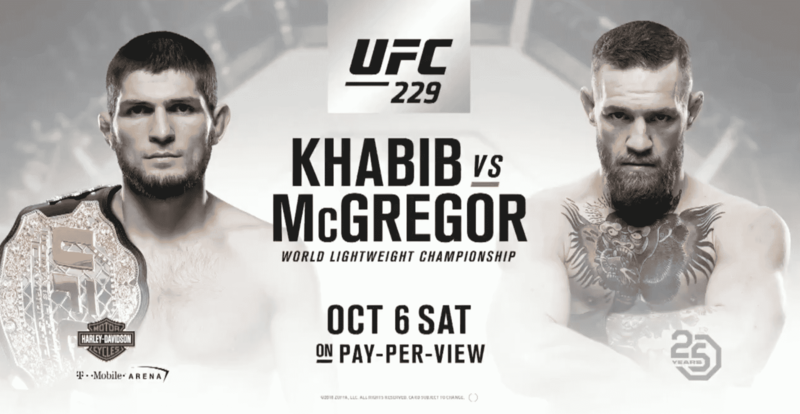 As it stands, UFC 229 will be taking place at the T-Mobile Arena in Las Vegas on October 6 with Conor McGregor and Khabib Nurmagomedov headling the event with the Russian making his maiden title defence. No other fights have been announced for the rest of the card yet, keep your eyes peeled.